Algae can form in any pool, and it can be extremely frustrating. Although it is not usually unsafe to swim in, no one wants to swim with algae. Prevention is the best option, but if it is too late for that, there are a variety of treatment options available. Algae are microscopic plant cells. They are always present in the water in small quantities, but they must “bloom” in order to be visible to the human eye. This is the process where a few algae cells grow, feed, and divide, producing more and more algae cells in your pool. Algae may also be transferred in larger quantities from people or swimsuits that are contaminated by other water sources. Most of the time, algae blooms because of inadequate sanitation, either in the form of poor filtration or improper chemical levels. It can also form because there is poor circulation in some areas of your pool. Under rails, in corners, and in other sheltered locations where treated water may not circulate properly are prime locations for algae growth. Algae feed on almost anything, including the dead skin cells and oils leftover from swimmers. This is one reason why algae blooms may occur after a pool has gotten a lot of use. Another source of algae food is runoff from garden fertilizers, so if you have a persistent algae problem, you should investigate if water regularly gets into your pool from your garden. In the pool industry, the over 21,000 types of algae are usually classed into three or four groups by color. Green, black, and yellow algae are all similar but slightly different from each other in terms of treatment. Some people include pink “algae,” which is actually a bacterial film, and white algae, as well. Green algae is the most common and the easiest to treat. It may form on the sides of the pool or it may be free-floating. 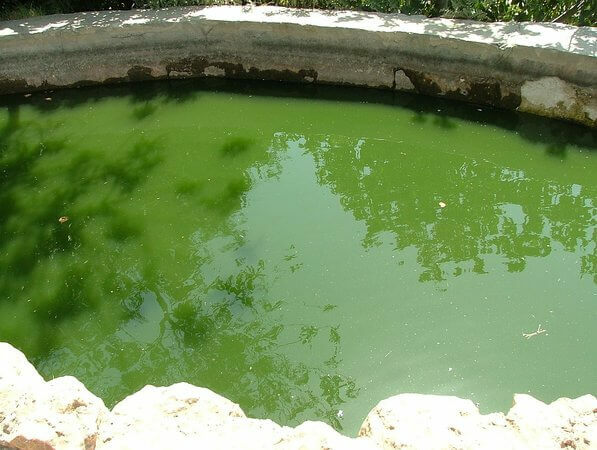 Green pools occur when enough free-floating algae of this type is present in the water. 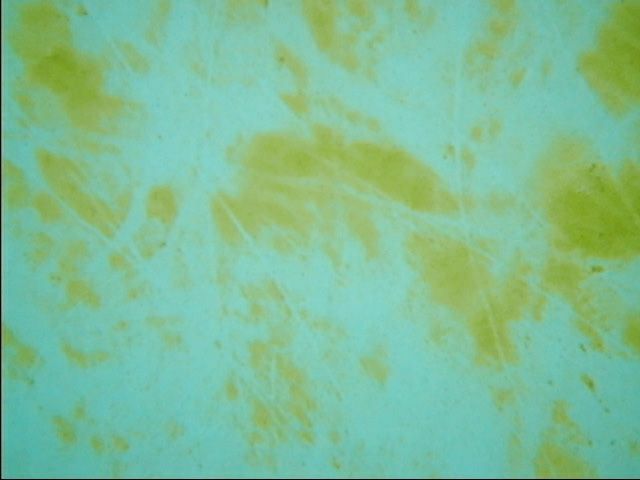 Yellow algae, which is also called mustard algae or brown algae, tends to occur on sheltered surfaces. This may be the floor or the walls of your pool. It can be harder to get rid of than green algae. Black algae usually shows up as spots on the walls, and it is extremely persistent but relatively rare. There are two major chemical treatments for algae: flocculant and chlorine. Flocculant, or floc, is a chemical and mechanical process that works fast but requires work on your part. After adding it, the floc makes all of the algae clump together, which then causes it to sink. You must then vacuum this out of your pool, pausing to allow it to settle as needed and refilling the pool with new water and chemicals. Chlorine shock is the most common method of dealing with algae via chemical means. It is usually dosed at twice the usual shock for green algae, three times for yellow algae, and four times for black algae. However, chlorine shock will not work if the algae is attached too tightly to the walls or floor. Because of this, you must use a brush to loosen the algae before shocking. How the filter is used depends on the chemical choice you make. If you add floc, you should run the filter in a recirculate mode or not run it at all, for a few hours. Then, you must turn it off to give the algae time to settle. If you use chlorine shock, you should run the filter almost continuously. Check regularly to make sure that the filter does not become clogged with algae, however. There are two major types of non-chemical solutions for algae, but both are aimed more at preventing algae blooms than dealing with one that is already in progress. Still, if you have a minor algae problem, you might be able to use one of these devices. You would need to first re-balance the water as normal, improve circulation, and brush the walls. Sonic and UV cleaners attach to your filtration system, typically after the water has been run through the filter to mechanically clean it. These devices are extremely effective at killing algae that comes through them. However, they are physical processes, not chemical ones, so they have no effect on algae cells that do not actually pass through the system. For this reason, they are much more effective preventative measures than treatment ones. Swimming pool algae can be a frustrating problem, and the last thing that you want after you finally get it under control is for it to come back. Luckily, algae is easier to prevent than it is to get rid of, so the hard part is already done. To avoid a future headache, invest a little time to work on preventing algae blooms. The main preventative treatment for algae is to improve the sanitation, circulation, and filtration in your pool. If you have a filter that is only just big enough for your pool, it may need to be run more or replaced with a larger one. Maintaining balanced water levels is also extremely important. If you have been battling algae for years in a plaster pool, it may be time to drain it and acid wash the surfaces. This is because algae can become embedded in the walls so thoroughly that you never really kill it all with other methods. Then, when the filtration system or chemical levels slip for just a moment, there is a new bloom. Here are some additional details about each of these treatments. If your pool filter is not cleaned regularly, it will likely become clogged and will not circulate water as well as it should. Algae spores in the water will not be removed at a high enough rate because not enough water is passing through the filter. In addition, clogged filtration material may actually harbor algae spores. Keep your filter clean and consider changing your filtration media after dealing with an algae bloom. Aside from sonic and UV technology, there are algaecides that can be used to prevent future algae buildup. Metallic algaecides do have some ability to kill off an algae bloom, but they are not usually the first line of treatment because they are expensive and otherwise not ideal in the quantities required to kill an active problem. As preventatives, they usually do a good job. Many products are available for killing and preventing algae growth. Routinely adding a small amount of high-quality algaecide may help prevent a problem from occurring. Avoid overuse, however, because these products can cause water imbalances if excess quantities are added. Mechanical cleaning is an important part of keeping algae out of your pool. Brushing and vacuuming remove algae from the walls and floor of your pool and puts it into suspension in the water. Algae stuck in the crevices of rough plaster may not be able to be removed any other way. Inadequate sanitation and high phosphate levels are major contributors to algae growth. Both of these risk factors can be tested for and treated as necessary. Regular testing allows you to catch these problems when they are only a minor issue and easy to fix. If you find that there are problems with the chemical levels in your pool water, fix them right away. It may be tempting to let minor issues go, but this may lead to bigger problems. The time to fix problems with the pH, chlorine levels, and other parameters of your pool water is as soon as you notice the issue.